From the first time I learned that we were moving to China, I started planning our Spring Festival vacation. Most places were ideas (“I bet Vietnam would be cool”, lots of conversations like that), but there was one place in particular that I was NOT going to miss out on—the incredible temple complex of Angkor Wat. This was a very cool moment. 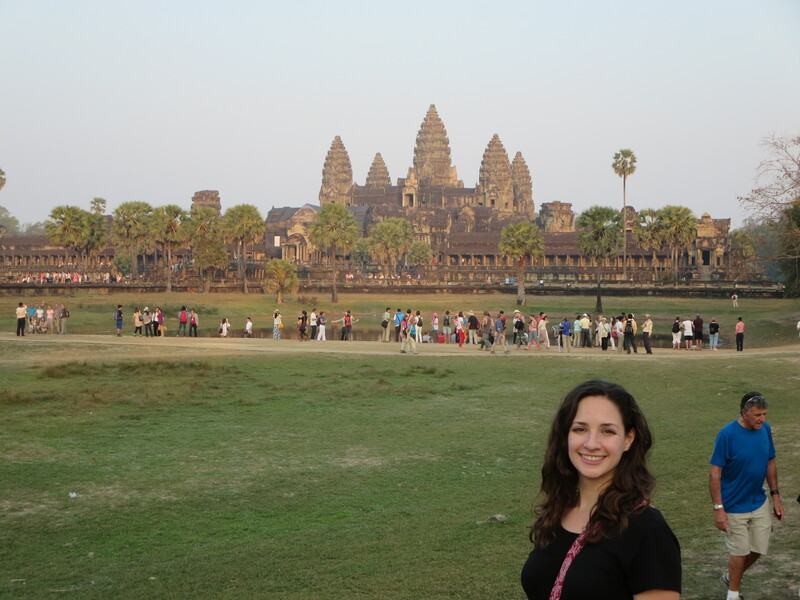 Day 1: Angkor Wat at sunset. Spenser and I arrived in Siem Reap via a Mekong riverboat and, after checking-in to our hotel and grabbing a bite to eat, we were beginning to lose sunlight. We rented some bikes ($1 each!) and biked the 3 miles to the Angkor historical site. Since this was our first time and it was almost sunset, we decided to only see the big Angkor Wat temple that day and boy, it was impressive. All of the guide books and internet facts say that the best times to go to the big temple are at sunrise and sunset. We just happened to get there for the sunset and yes, it was beautiful, but there were tourists EVERYWHERE! Hardly the intimate temple experience I was expecting. In turn, Spenser and I decided to call it a day and plan on going inside the complex later. 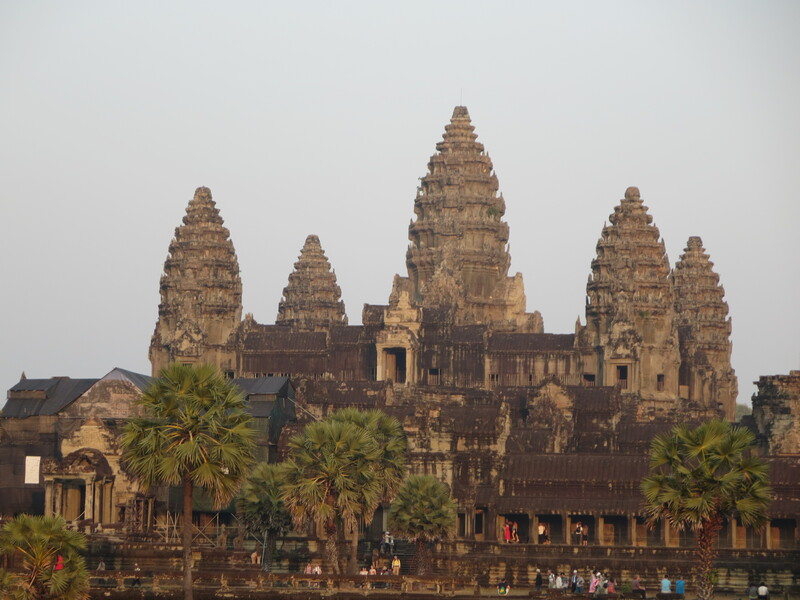 Angkor Wat is the largest temple in the Angkor Archaeological Park. The Angkor Archaeological Park, by the way, is MASSIVE (150 sq. miles massive). Sure, it’s only a 3 mile bike ride out there from Siem Reap, but you’re going to put many more miles on that bike before returning home. You cannot walk to each temple. You either have to bike, tuk tuk, or drive to get to each one in a reasonable amount of time. So for our second day, Spenser and I awoke bright and early, got some bahn mi sandwiches and bottled water, and headed out to the park. 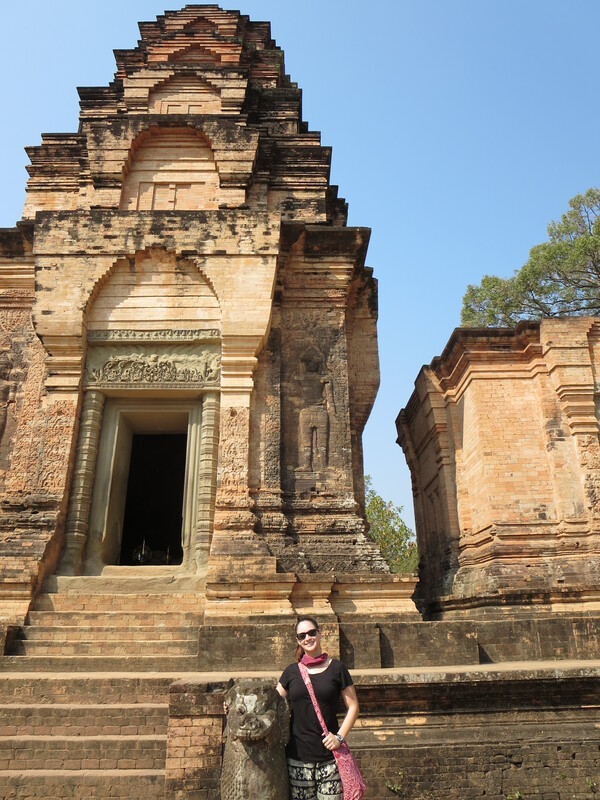 The first temple we visited was Prasat Kravan. This smaller temple was built in the 10th century and it radiated a gorgeous ochre glow in the morning sunshine. Thankfully, there were only a small handful of tourists here, so it was a great introduction to what we would see in the rest of the complex. After we were done at Kravan, we hopped back on our bikes and headed to Banteay Kdei or The Citadel of Chambers (oooh, sounds scary). This temple was really fun because it felt more incorporated into the natural environment than Kravan. Green lichen was growing all over the stones and it was more hidden among the trees. And when you walk out of the complex, a big lake (and some small shops) greet you across the way. This was fortunate because Spenser tore a hole in his pants (HA HA!) and had to buy new ones. Because many of the temples in the Angkor facility are still active religious sites, you need to respect their traditions and dress appropriately (no sleeveless shirts, shorts, mini skirts, etc.). Spenser’s ridiculous genie pants were actually necessary. 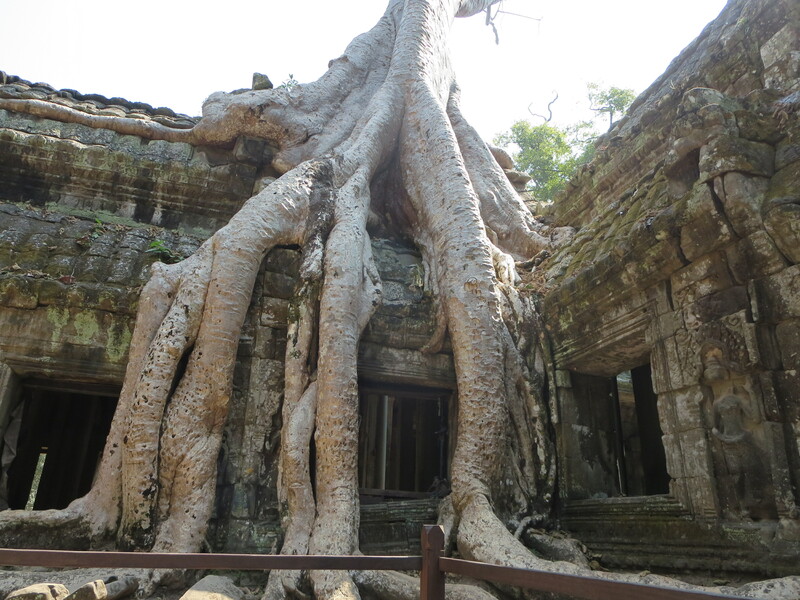 We saw a few more temples along the way, but the next (and my most favorite) temple, Ta Prohm was incredible. I have seen pictures of this temple since I was little and this was at the top of my Angkor checklist. Nature takes what it wants! This place was awesome. It was huge and, even though it is one of the more popular temples in Angkor, it was easy to go off the beaten path and trek alone. The trees encroached upon everything and they made the already impressive temple feel like a surreal wonderland. Oh no! Beware the Man Eating Tree! Damn. That’s a big tree. 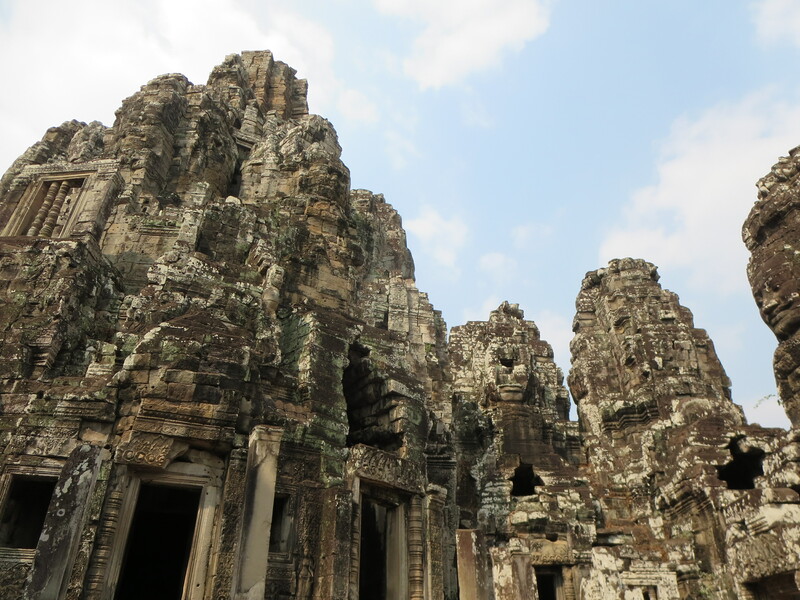 At Ta Prohm we snacked on our sandwiches, drank lots of water (even in January, Cambodia was really hot! ), and I started to slow down. My enthusiasm got the best of me (as it usually does), so as we got further into the late afternoon, temple trekking became much harder. We eventually found a pyramid temple and, of course, we had to climb it. We hit up a few other temples on our way back, but I was so tired at this point that I forgot to take more pictures. Oops. We biked back to Siem Reap around 3:30 and we immediately passed out as soon as we got to the hotel. 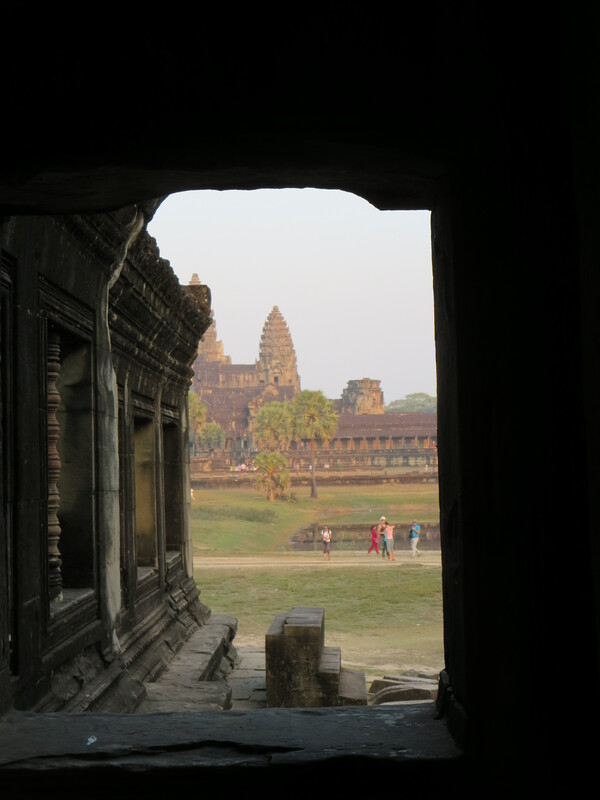 Achy and exhausted, we tried to save what energy we had left for our final Angkor day. On our last day visiting the Angkor Archaeological Park we decided to revisit Angkor Wat proper and give it the attention it deserves. The details within the temple are extraordinary. Bas-reliefs, high relief friezes, entire walls carved with scenes of battles, and Hindu and Buddhist influences everywhere! It was overwhelming. Also, I hate to sound like a broken record, but it’s massive! 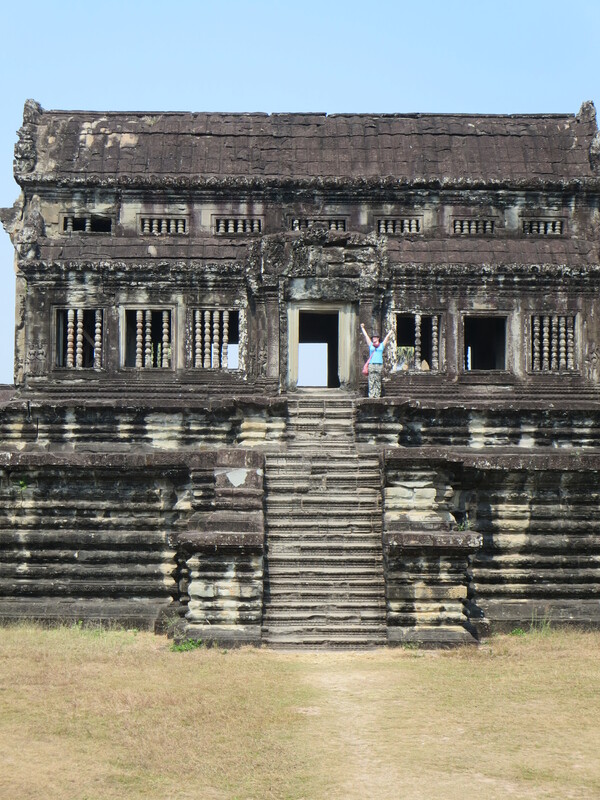 Look at little old me standing on one of the four stand alone temples within the Angkor Wat walls. Yeah, like I said, this place is gigantic, so enjoy even more pictures! 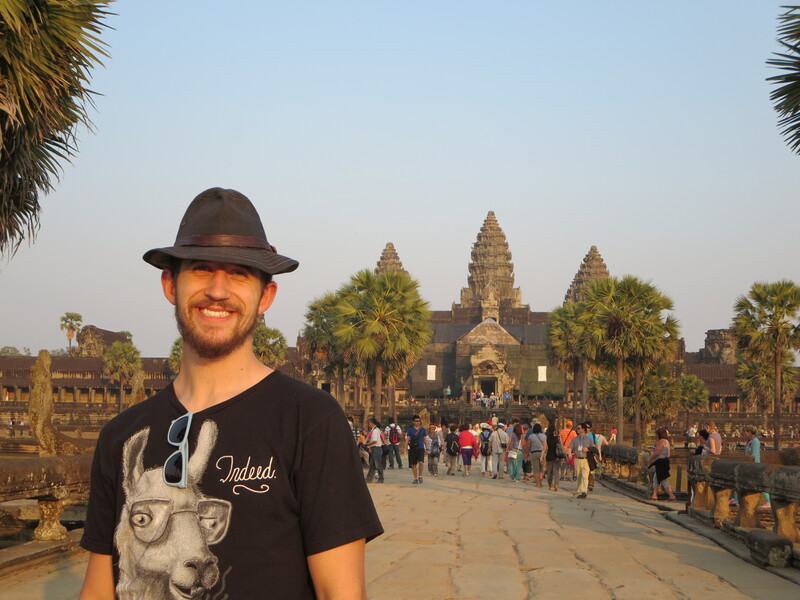 Tomb raiding around Angkor Wat was a landmark moment for me. It was incredible. As exhausted as we were by the end of it, I was so proud of us for really trying to see and do as much as we could there; we did it all by ourselves too! Just me, Spenser, and our bikes among 700 year old temples in a truly special part of the world. I’ll have those memories forever. Thanks again Cambodia! What a cool-looking place, and what luck for you two! 🙂 I am jealous. Wow, that would be quite a sight in person. Lucky kids.